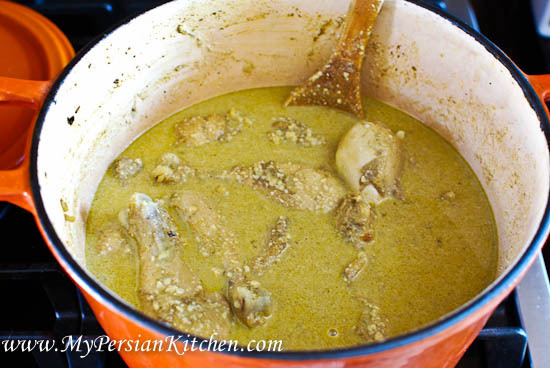 During the years that I spend in Iran I never knew there was such thing as Curry Khoresht. In fact, for the longest time I mistakenly thought that only Indian dishes used curry powder. Ironically, it wasn’t until I moved to Los Angeles that I had a “Persian Curry Stew” for the first time. I remember being very surprised for three reasons. The first reason was obviously using curry powder which I only associated with Indian cuisine. The second reason was the fact that the stew was mild and not spicy. The third reason was the fact that the stew was very simplistic in its preparation; in fact, it didn’t have any vegetables, it was simply chicken pieces in a delicious thick curry sauce. 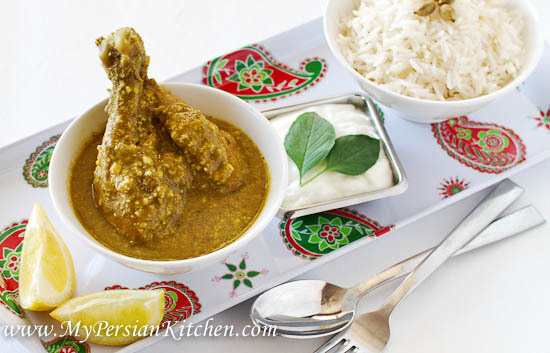 As I mentioned last week in my Cardamom Rice post, my mom suggested making Ms. Montazami’s Curry Khoreht. She had made it a while back and raved about the addition of cashew nuts. My mom had made some minor variations to the recipe which she passed on and I went to work. I mentioned last week that I was not particularly happy with the end results as I found the stew to be a little under flavored even though I had added more curry powder than suggested in the original recipe. I made some minor changes and both the Sous Chef and I were pretty happy with the more flavorful results!!! Small dice onion and sauté in olive oil until just golden. 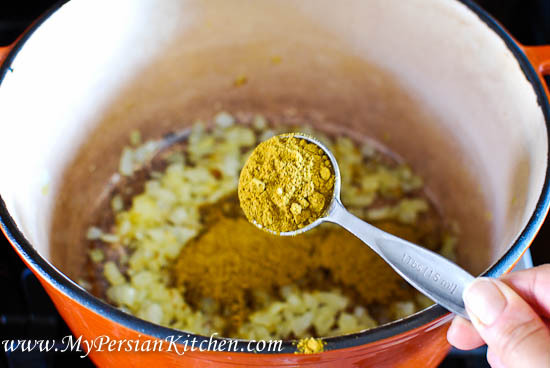 Add curry powder and stir with onion. Allow for the curry powder to heat through until its fragrance rises. 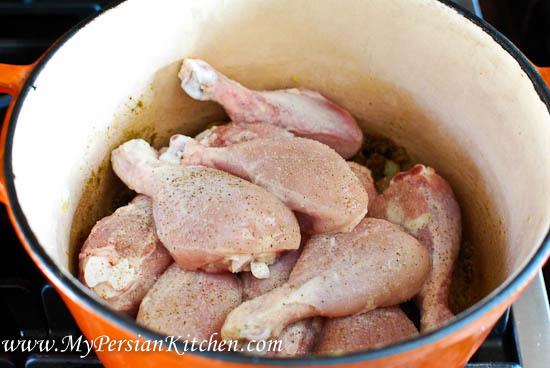 Remove skin from chicken drumsticks then season with salt and pepper. 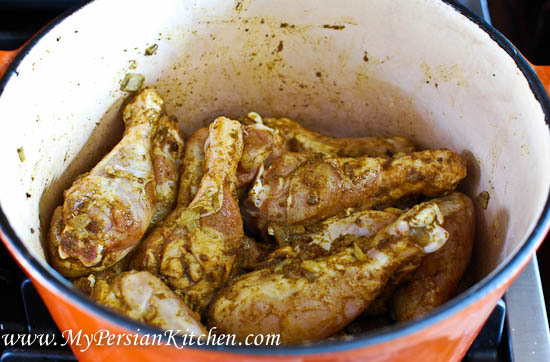 Add to the pot and move around so that the curry powder and onions coat the chicken pieces. Cook chicken for a few minutes until the flesh turns white. 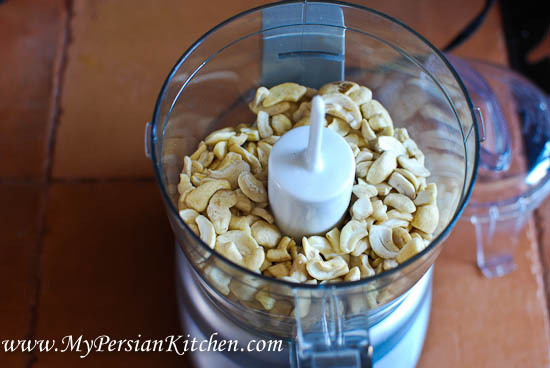 In the mean time, place cashew nuts in a food processor and grind thoroughly. Add ground cashew nuts to chicken. Add 2 cups of water and mix well making sure to scrape the bottom of the pot. Cover and bring to a simmer. Cook on low for 1 hour. Make sure to stir the stew several times during the cooking time as the ground cashews easily stick to the bottom of the pot. 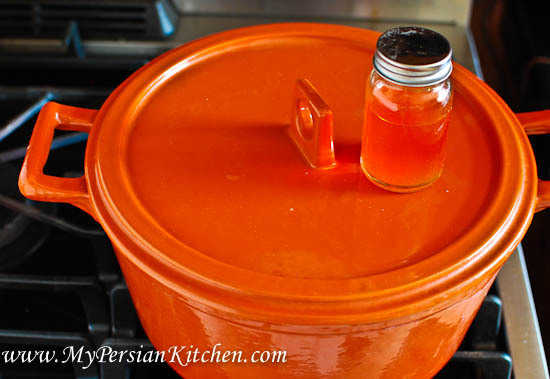 In a small glass jar add ground saffron and 1/4 cup of hot water. Close lid and shake well. 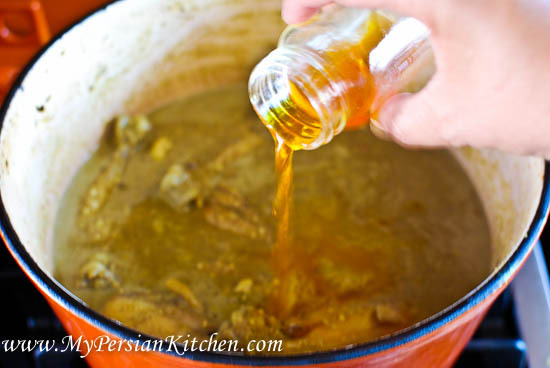 Place the glass jar with saffron on top of the pot where the curry is cooking. 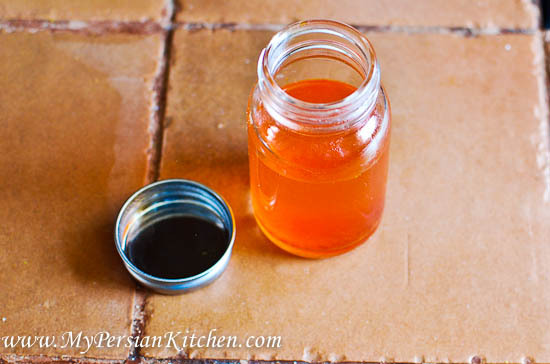 This step will help with the “brewing” of the saffron and intensify its flavor. 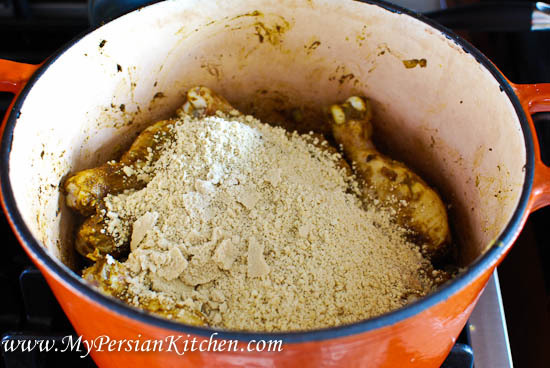 Once the stew has thickened and the chicken is cooked taste and adjust seasoning as needed. 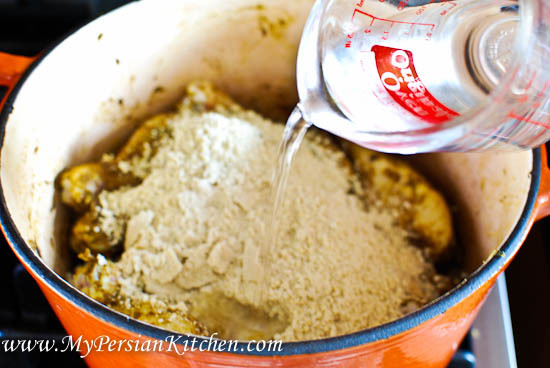 Add brewed saffron. Then squeeze fresh lemon juice. Mix well and continue cooking for 10 minutes longer. Please note that for this recipe you can use either mild or hot curry based on your preference. 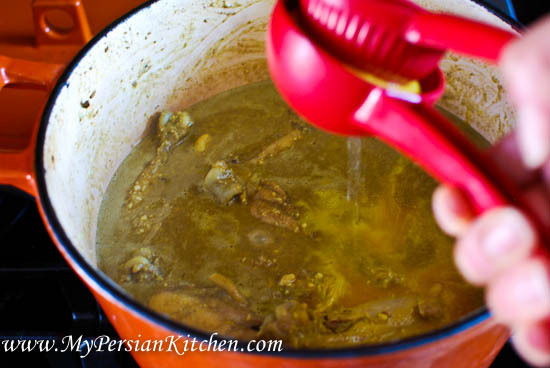 Serve Persian Curry stew Chelow, White Rice, or Cardamom Rice. *Post includes Amazon Affiliates links.